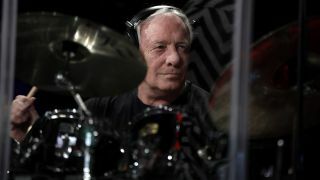 Marillion drummer Ian Mosley is the subject of a new book written by his friend of 20 years, Georgina Wistow. It’s titled Do I Owe You Money? The Collected Memoirs Of Ian Mosley and it’ll be released on March 19 via WizardofMos Publishing. Wistow began to document Mosley’s stories after listening to countless tales of his over the years – and she decided that fans would like to hear them, too, with the pair working on the book together over the last two years. A statement on the book reads: “From a misspent youth in North London, through naked musicals, Dutch prog bands, being a milkman and a Mini Tone, this book follows the path of a boy who just wanted to drum, to a man living his dream, and all that entails. Pre-order details will be revealed in due course. Marillion, meanwhile, will head out on the road across the UK later this year for an orchestral tour. The run of 13 shows will kick off at Liverpool’s Philharmonic on November 1 and conclude with two nights at London’s Royal Albert Hall on November 18 and 19.